In a temple, or a mosque, all heads bow down in front of the almighty, irrespective of status or gender. Every kind of prayer requires the soul to be pure and the head to be covered, irrespective of religion. Turbans and caps change shape every few kilometres, duppattas and scarves have different colours and patterns in every state. Headgear is one of the strongest and the most obvious sign of identity, framing the face of every individual. A mark of identity, in rich gold and white, crowns the head of a Bohra man, whether he is dressed up for prayer, or participating in festivities, or just going to work. 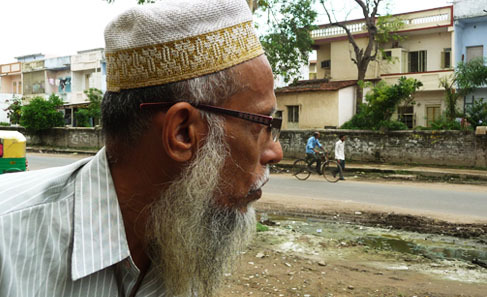 Men in the Dawoodi Bohra community proudly wear intricately crocheted caps made by women in their families. Earlier worn only during Namaaz and festivals, now its usage has spread to everyday wear. Just like new clothes, new caps are also made for special occasions. 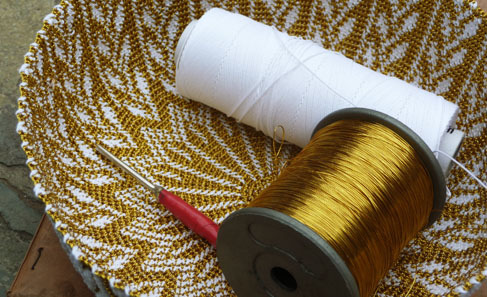 Crochet is the technique of fabric construction by puling loops of yarns though other loops, using a special hook. The origin of crocheting is not known, although this craft gained popularity in Europe in the 19thCentury. 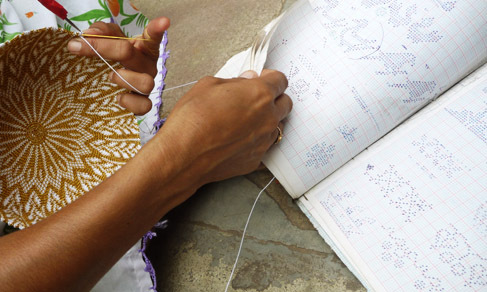 Today, crochet is a favourite hobby among many, although its use is not as widespread. 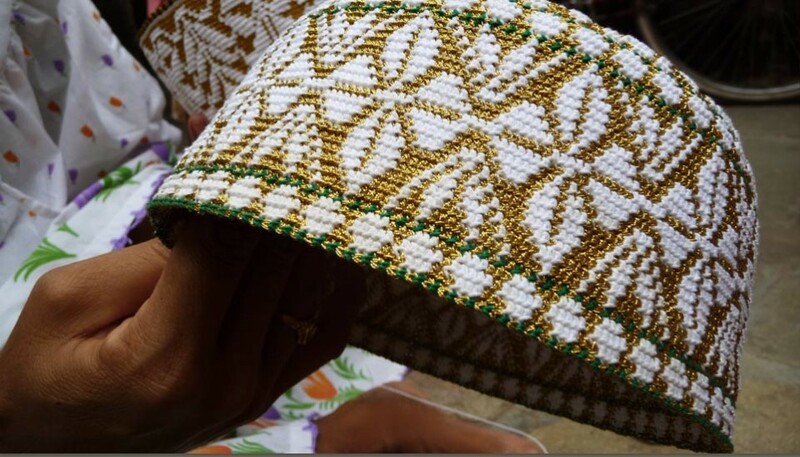 The Bohra caps are completely made by hand, using this method. A plastic or aluminum vessel of the required size is used as a frame for making the cap. Caps range from a circumference of 19” to 23”, depending on the age of the wearer. Little caps for babies just a couple of months old are also made. Unlike regular crochet, which is made with wool or acrylic yarns and has an open structure, the crochet on these caps is very fine and close knit. 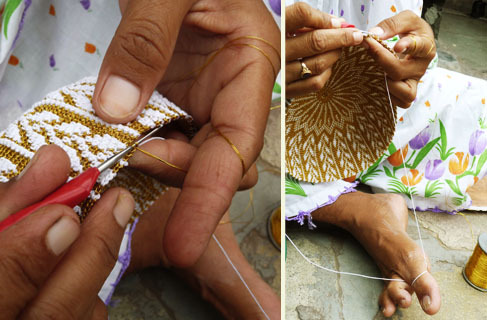 The women use white kite string cotton or nylon, with golden yarn that is known as kasab. Caps made for festive occasions may have a lot of kasab work, sometimes with very little white visible. No other colour is used on the caps, except an occasional touch of black or green on the borders. Both the yarns and the crochet hook are very fine, making the process tedious, but the final outcome is impeccably intricate. The stiffness of the yarns also helps in maintaining the shape of the cap. Starting from the centre of the top of the cap, they follow a spiral pattern of stitching, incorporating various motifs in perfect composition and symmetry. 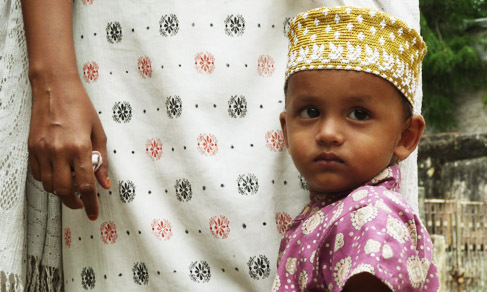 While common motifs are geometrical or stylized florals, little boys like to wear caps adorned with depictions of animals like rabbits, sheep, ducks etc. Sitting together in the daytime, women of a community refer to pattern books and make beautiful motifs on these caps. 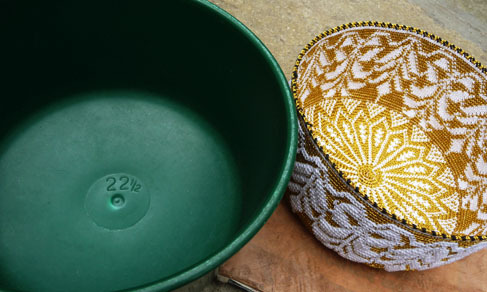 There is a friendly competition of who can make the most beautiful, or the most intricate cap. Stitch by stitch, as they build the spiral, beautiful designs in gold form and slowly the headgear, the identity of the Bohris, takes shape. Some women also extend their skill into making purses, mobile phone covers, handkerchiefs and laces for decoration of clothes. During the month of Ramzaan, they also make prayer mats. These enterprising women make good use of their art and make caps for selling in local shops. 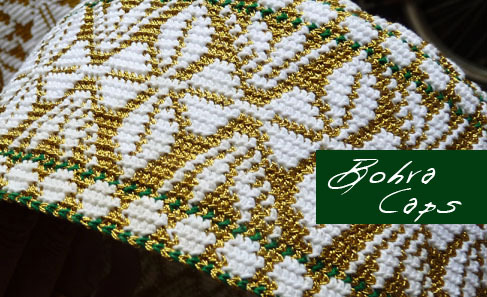 Young Bohra girls also wear caps, although these are not crocheted, but made by covering a stiff material, like an X-ray sheet, with an embellished fabric. Once they reach teenage, they switch to ridas, which are sometimes decorated with crochet work on the hems. Never staying idle, women use their workmanship to create what is aptly called “Sar ka Taaj”, or crown of the head.